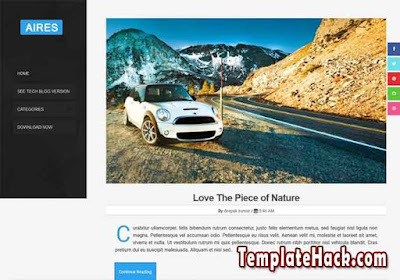 TemplateHack.com - Download Aires Responsive premium blogger template. Aires is very simple blogger theme designed for your magazine blog, portal blog, personal blog, fashion blog, news blog, biography blog, and etc. With simple and clean design, also responsive design, this template will make your blog more powerfull. Your blog will be faster loaded on the first time and cannot make our eye sick. Because this template use simple color base, black, white, and soft blue. I think it is the best blogger template for your blog because it is optimized on SEO (search engine optimized), so you can compete versus other blog on search engine Google, Bing, Yahoo, and etc.